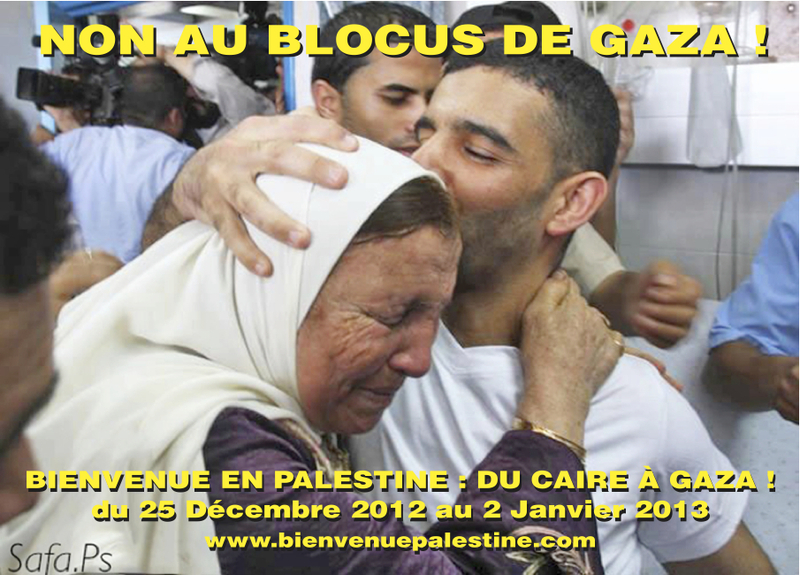 NEW MISSION FROM CAIRO TO GAZA: FROM 25 DECEMBER 2012 TO 2 JANUARY 2013! The whole of Palestine has become a vast prison. Therefore, we shall continue to say NO to the isolation of the Palestinians until they are free: Free to move, free to work, study, look after themselves, live in peace in their own territory and to return after being expelled. By now in the Gaza Strip, the blockade has strangled the population for six long years, with the well-known dramatic consequences on women, men and children, regarding sanitary, economic and educational conditions and the permanent anxiety caused by the air raids which have never ceased since the terrible winter 2008-2009 massacres. The world tends to forget about it: Time goes by and the media fall silent. Our governments contribute to perpetuating this inhuman situation endured by nearly two million human beings deprived of electricity, drinking water, formula milk and future prospects. And what about us? There is no question of our making this barbarity seem ordinary. We had wanted to go to Gaza in December 2009. We took part in the march for Gaza but we were blocked in Cairo by Mubarak. At a price! The whole world was called to witness to the collaboration between this tyrant and the Israeli occupier. Moreover, the Egyptians remembered this, when the time came… as told by the writer Alaa Al Aswany (http://www.europalestine.com/spip.php?article4667). Since then, three years have passed: Very long years for the Gazans. However, important events took place in Egypt, when the population succeeded in ousting Mubarak during a tremendous uprising. So the time is long overdue to lift this shameful blockade, whether or not the Israelis like it. To better concretize our intentions, we have decided to go and meet the Gazan population on 27 December, the sad anniversary of the first Israeli bomb attacks on the civilian population. The bombing started on a Saturday at lunchtime, when children were coming out of school. That was precisely, on a Saturday, which shows how unimportant the Jewish religion is for the Jewish state! Indeed, the schools were targeted and nearly 400 Palestinian children were killed during these three weeks of bombing – not to mention thousands of others who were wounded or mutilated, who lost their parents, brothers or sisters. We have not forgotten them. We do think that it is important to remind the world how intolerable this bombing and this blockade are, how deeply upset we are as human beings. We have planned to meet with admirable women and men who courageously struggle for survival, from 27 to 31 December included: Of course, we want to spend New Year’s Eve with our Gazan friends. However, before we do this, we shall stop at Cairo, to say hello to our Egyptian friends and congratulate them for the amazing camaraderie and intelligence they showed to free themselves from tyranny! Please take time to look at the other items on this site, in order to get more information on this mission.